I woke up one Saturday with the desperate urge to get my hair done. It had only been six months – I am terrible about not scheduling regular hair appointments, especially when most of the time, my hair is pulled up in a ponytail on top of my head. I took off with my child, who was more desperate for a haircut than I was. He looked like he needed to be on an album cover with some dudes named Ringo and George. Hours later, we looked like two different people. You could actually see my child’s eyes and ears now and my grays were replaced with coppery highlights. “You did what to your hair?” was Mama’s response when I told her how Cole and I had spent the day. “I got the layers trimmed and had some coppery, light auburn highlights put in. It’s so nice to have my hair done, Mama,” I answered. She gave her “hrrrrmph” of a grunt. “Why in the world did you go and do that?” she asked. When I was younger, it seemed like I was the only girl with dark hair in a sea of glorious blondes. I would cut out yellow construction paper and tape them to pictures of myself throughout the house, wondering how I would look as a blonde. I was in my late 30’s before I ever colored my hair and I loved it. Streaks of caramel, deep cherry and other decadent sounding colors were swirled into my hair. Mama hated them all. Then one winter day, my hair was chopped off and dyed a flaming red. I felt like Jean Gray from “The X-Men.” Mama nearly had a seizure when she saw it. It will. It will be fuchsia or purple or I will take Cole’s suggestion and shave it into a Mohawk. Surely I am not the only one who goes through that with their mother? Those circumstances where the umbilical cord is still attached and the boundaries are hazy. Where just because that is what your mama would do is what she expects you – her daughter, her child, her son – to do as well. Mama has told me countless times how I needed to “get a job with benefits, a retirement package and a union” like she had. I’ve told her those jobs don’t exist anymore. She’s worried, criticized and been downright angry about a lot of my choices and decisions. I don’t know if it is because of anything I did or if it was just because it wasn’t what she would have done. Surely, she knows I am my own person. Right? Cole was in deep explanation about his Minecraft game to me one day, as I listened but didn’t really understand completely what he was telling me. Usually, he’s telling me something a little bit more high tech than I can follow, so I smile and nod and encourage him to continue, just hoping he is not uploading videos of me sleeping to YouTube. “Do you even know what I am talking about?” he asked, seeing my eyes glaze over like doughnuts. He frowned. “You don’t like this do you? But aren’t you supposed to like it?” he said. “Cole, it’s fine if I don’t understand or even like it – if you do. I have an interest in it simply because you enjoy it, but it’s not something I will be doing on my own,” I explained. If anything, it’s the way it is supposed to be. And no one knows that better than I do. I hate spiders. I know they play their role in the food chain, eating mosquitoes. That is all they are good for. I hate them. They are sneaky little arachnids, creeping out when they know I am defenseless. As I walk into the bathroom, one has dropped down from the ceiling in front of me. Another scurried out from under my chair one morning, where I sat, coffee cup in hand, journal in the other, bedroom slippers on the floor with my bare feet tucked under me. Lamar had taken the dogs out and it was just hitting sunrise. This monstrosity of a spider scurried out and jumped when I looked at it. I cursed it. I called it bad things. Really bad things. It looked at me, as if it knew I was barefoot and scared. I slowly got out of my chair and tried to grab one of Lamar’s boots on the hearth. None of my shoes would be big enough to squish it – hey, the skinniest thing about me is my feet – and my fuzzy baby blue bedroom slippers did not need to be sullied with spider gut juice. I tried to throw the boot at the spider but the boot was heavier than I anticipated and the spider hopped closer towards me. I grabbed the other boot and then realized as I was lifting it off the floor that I was pretty defenseless – I was barefoot and the huge spider was on the floor and I have lousy aim. Somehow, the spider decided to retreat and squeezed out the crack of the door to the back deck. I curled back in my chair, waiting on Lamar and the girls. I heard a solid stomp a few moments later, thinking Lamar was just knocking mud off his shoes. Usually, if a spider was outside, Lamar let it live. He tried to be respectful of all critters. But this was one angry looking spider that had a vendetta. I feel like if God wanted us to love them he would have put fur and four legs on it. If it has more than four legs and slithers, it’s straight from some evil underworld and should die. But it was some sort of influx of spider apocalypse because the next day, Cole saw another monster spider hanging outside of the bedroom window. I told him bugs were his Dad’s territory. Lamar didn’t believe him. Lamar tried to assure him if it was on the outside of the window it was fine, but Cole wouldn’t take no for an answer. Lamar finally gave in and went to look. A split second passed and Lamar came flying out of the bedroom. I told him to check the bathroom. He came out, holding a can. He grabbed the can and his torch lighter and off on the porch he went, Cole in hot pursuit, giggling like a mad man. It scared me the delight my child took at pyrotechnics. Minutes later, my house was still standing, but the spider had been barbecued. “That spider won’t be coming in tonight,” Cole said, quite proud of his father’s flame torching skills. A few nights later, I went in the bathroom to get ready for bed, Cole telling me he didn’t know why he couldn’t stay up a little bit later. I screamed. I pointed towards the bathmat, where a scorpion pulled up his arms as if it was waving. He ran to get Lamar while I kept an eye on the scorpion. I had already sprayed it – the VO5 did nothing to it, but I bet if it had hair it could withstand gale force winds from the amount I sprayed. It crawled towards me. I jumped and squealed. Again, fuzzy baby blue bedroom slippers were not going to withstand scorpion gut juice. Lamar pushed me aside, and took the hairspray from me, lighter in hand. “The bathmat!” I screamed. Oh, dear Lord. He was going to set the bathroom on fire. He gave it one blast. The bathmat was apparently flame resistant. Not even a scorch. The scorpion was too. It was still alive. “It’s a mutant!” Cole screamed. Lamar pushed us both out of the bathroom and blasted it again. I ran in the bedroom to hide with the ferocious pit who was shaking at all the screaming, wild carrying on and fire. She was nervously tearing up a tissue to hide under my pillow. “It’s dead, it took five times to torch it, but it’s dead,” he announced. Cole cheered. I just wanted to move. When you get to the point you have to start fires to kill the bugs, it’s just time to move. The next week’s fire-death tally brought three more spiders. I think by this point, Cole was trying to find spiders to set on fire. He is so scared of them, he’s turned into Al Capone when it comes to spiders, putting out a hit on all of them. I hate them too, but my husband and child were enjoying sending them to a fiery purgatory of arachnid judgment just a tad too much. And I live in a wood house. The only flame resistant thing in here is the bathmats. As we rode to dinner with Lamar’s sister and brother-in-law one evening, Cole was giving the death tally to his aunt and uncle. I hope the spiders don’t ever set up home in one of those bath mats. I have a bad habit of ‘shoulda’-ing on everything. I’ve done it for quite a while, unfortunately, and just now realized it. I think most people ‘shoulda’ about what they personally should have done. Our hindsight is always so crystal – we can see better choices, better options, the errors we made. If only we had done this, done that, not done what we did. A lot of shoulda happens in the dark corners of our mind when we think about things. Usually, I don’t get caught up in the things I should have done. My rationale is it is in the past, it is done, over, kaput and I can’t hop in a DeLorean and travel back to change anything. Sure, I’ve made my share of mistakes. I have made some humdingers and some doozies. But I guess I am either foolish or wise enough (there is a pretty thin line there) to know that there’s not a lot that can be done about it in the present. My biggest pile of shoulda involves what I think others shoulda done. It’s a generational shoulda, really. I do this like my Mama, who is only repeating what she saw her own mama do. It’s terrible, really. We don’t even realize how bad we were at shoulda-ing. When I lost three of my pups last summer – all within a month – I made a mental note of who had expressed their condolences. Probably more importantly, I noted who did not. On both sides, I was shocked. Some people I had not spoken to in years offered sympathy; a few who were supposed to be my dearest friends didn’t even acknowledge my loss. I filed it all away in my little mental safe, telling myself that it was during those moments we found out who our true friends were, who really cared about us and those that were not real friends. When Granny passed away the following spring, a similar thing occurred. Some people expressed sympathy; some people didn’t. We won’t even get into the texts messages I received as I sat with my Mama and uncle, making her arrangements, by people who knew good and well where I was, two hours away and the nature of the business I was tending to. I uttered some bad words and curses that woulda made my Granny proud. It hurts when we grieve, when we succeed or have any significant thing happen in our life and the people we have invested time in don’t acknowledge it. I honestly think this happens to everyone. Is it a matter of sometimes, we just care more about others than they do us? Or are some people so self-involved that if it isn’t about them, they don’t care? Mama was talking about Granny the other day and mentioned how one of the few, rare friends that had outlived the old gal didn’t even call to say she was sorry Granny had passed. I understood – believe me. I did. To the very core of my being, I knew where Mama was coming from and this time, I let her rant. Mama made her little ‘hrrmping’ noise she makes when her fur is petted backwards. “She should have at least called to say she was sorry,” was her final comment. I try or at least I think I do, to care and comment and praise or empathize with those I care about. Try being the operative word here. I am not as great at that as I should be. On Cole’s birthday, I received an email, sending SuperBaby well wishes and wanting an update on what was new in my world. It had been close to a year since our last emails. Why hadn’t I emailed her, or called her? I knew how she had been grieving – why hadn’t I been the one to send an email or a card or a call, or heck, an impersonal text message and say, ‘how are you?’, ‘I am thinking about you.’ No, I hadn’t. And boy, I shoulda. I really shoulda. Mama was fussing again a few days later. This time, my heart, was softened, having compassion instead of filled with shouldas. Mama was quiet. She does that when she is considering I may actually know a thing or two. We shoulda done that a long time ago. A good question, I thought. It was not even Halloween yet. Heck, this was a few weeks ago. But there among the leftover school supplies and Halloween candy were Christmas stockings and some tinsel. “They are wanting to get customers into the spirit early I guess,” was my answer. It seemed wrong to my child. He wanted to make himself have a toothache on Halloween and not feel bad about his gluttony; kind of hard to do if you have perpetual reminders Santa was watching. “Does it work?” he wanted to know. I doubted it. They had been moving Christmas up earlier and earlier each year and so far it hadn’t motivated me to shop any earlier. I still did my mad dash on Dec. 23. The holidays had all become one mushed up rush of blurred lines where we are told to rush, rush, rush from one experience to the next instead of enjoying the memories that are being made during that occasion. I had frowned when I saw the Halloween costumes being displayed before school started. How can I decide between a witch or fairy princess when it’s too dadblamed hot to even begin to think about putting something latex with faux suede on my thighs in 100-degree weather? It’s hard to choose what bags of candy to get for yourself and what to get for possible trick-or-treaters if you are trying to remember if all the lights worked on your Christmas tree. For that matter, I was trying to remember where my little pink tree was. It seemed like Lamar had left it out – it took up precious real estate in the barn that houses bicycle paraphernalia – and I heard him murmur he had to toss it. Maybe I needed to go ahead and buy a new tree? They were already out on display. I think it goes beyond retailers wanting to maximize shopping days in the fourth quarter. I think it has to do with our rush-rush-rush, instant gratification pace we have come accustomed to. Everything is smooshed together so we can multi-task. Much like the way we have to stay connected on our phones, checking updates, emails and letting the world know what we are having for dinner – all while pretending to get in quality time with our families as we simultaneously work on something else. I am guilty of this myself, which is why I know all too well the feeling of being overwhelmingly, hectically rushed. “Did they have Santas out before Halloween when you were a little girl?” Cole wanted to know, holding a snow globe in one hand, a black cat in another. No. Back in the olden days of the ‘70s and ‘80s, when life was wonderful despite the polyester and the shag carpet, we had separation of holidays. Halloween was honored with black and orange taffy, candy corn and plastic masks we couldn’t breathe in. Thanksgiving was weeks later and was basically the day of honoring football and feasts. Christmas did not officially kick off until the gaudy green and red streamers were wrapped around the light poles in the Sears parking lot. Around that same time, maybe a few weeks before, the Sears Wish Book was delivered, which let every child know to get their act together because Christmas was coming. Granny would give me the cherished catalog with instructions to circle the stuff I wanted for Christmas. “And just because you circle it, don’t mean you gonna be getting it,” she would remind me. Sometimes, things ran out or were on back order and either Granny picked something else off the list or she asked if I wanted to wait until it was available. Sometimes, I waited. Some things were worth the wait, even if they were for Christmas. No Black Friday, no Cyber Monday. There wasn’t Amazon drones to deliver, it was real people you’d see bringing the boxes in to the counter. And dangit, it all started in December. We pretty much considered the days after Thanksgiving to be the days we digested – not the days we strove to see how much money we could save by spending oodles at ungodly hours while fighting strangers for Elmo dolls and things we didn’t need. And somehow, despite the lack of early displays urging us to “believe” and “celebrate,” those memories were special. Simpler, and not memorialized on Instagram and heaven help – Granny didn’t even get a recipe off Pinterest – but they were far more meaningful. “You don’t think they would lump them all together, do you?” Cole wondered. Unless they could lump Easter in there, then that may be another story. 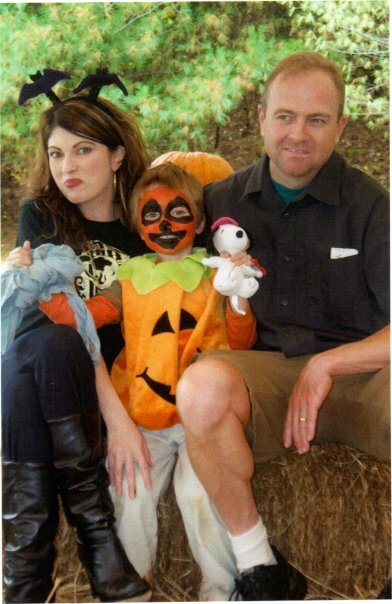 photo: The family celebrating Halloween, 2009. Cole was going as The Great Pumpkin Charlie Brown, complete with blue blankie and a Snoopy. “I love you more” has been an ongoing thing between my son and me. He has declared on many a time, that it is he who loves me the mostest. I tell him there is no way. “To the moon and beyond,” he would say, pointing his little finger to the ceiling. “Impossible,” is his response as he snuggles close, smiling happily at the knowledge that he is loved. I assure him it is not impossible at all, but very much the truth. “You smell pretty,” he tells me every time he gives me a hug. The little bee charmer will even tell me I am beautiful when I am sitting at my laptop, hair piled on my head and a coffee stain on my blouse. “No, I am not, baby,” I will reply. No one told me how precious little boys were. All I remembered was hearing the rhyme about little girls being made of sugar and spice. I knew as a former little girl myself, that meant I could be quite the sassmaker. Little boys were supposed to be made of snips and snails and puppy dog tails – in other words, dirty, vile and nasty things. I would take that over sass any day. “Did you ever want a girl?” Cole asked me one day. “I am glad I had you and that you are you,” was my sincere reply. This makes him smile widely as he skips off to play. He is secure in the knowledge that he is loved, cherished and adored. He has boundaries, and rules to give him his parameters in which to grow and develop. Kindness and compassion are required; chocolate cake or brownies are perfectly acceptable for breakfast. But I want him to stay that precious, innocent, tenderhearted child he is, just a little bit longer. I worry that the world will make him hardened. I fear he will let someone’s cruelty put out his inner ‘spark,’ as he calls it. I dread the thought of him ever having a broken heart or dealing with any disappointment that can’t be fixed by Mama making cupcakes or taking him to the park. There may be a time, in the not so distant future, that Mama may not hold that special place in his heart as I do now. Where he doesn’t come ask my opinion first, before he does a friend and where no matter what Daddy says, Mama’s word is final. But I cherish the fact that now, for the time being, he is still my little boy and my one-and-only and my heart and that now, he thinks I hung the moon. My own teen years made me think my own mother knew nothing, a disillusion that I held until my mid-twenties. Today, he rounded double digits, entering a new decade, one where he is now 10 and has been telling me, “I am not cute, I am serious,” when I comment how adorable I think he is. He still lets me hold his hand when we cross the street, or puts his arms around my waist to walk in step with me. He sees no shame in showing his unabashed joy at seeing his aunt Karla, the weekend before the big 1-0 as he ran down the hall of the hotel with joy to jump into her arms. He still has that great love affair with a certain plush pig and the other plushies of Piglandia, occasionally asking me if I still believe the pigs are real. He’s changed so much in a lightning fast decade, growing taller, gaining quiet confidence and learning compassion. Teaching me about faith, tolerance and acceptance along the way. Things I should have taught him but he has brought the lessons to me. He still needs Mama to help him fall asleep, as I sing him softly to sleep, me on one side, the pit mix, Angel Doodle on the other, guarding the pigs. “I love you, Mama,” he said sleepily. “I love you more,” I said, my standard reply. “You know why I don’t say impossible anymore?” he asked, seeing my questioning look. I nodded. “So no more ‘impossible? '” I asked. He gave me a quick hug before he skipped off, to build things in Minecraft and watch his cartoons. Growing up, faster than I liked but gaining insight and wisdom with each passing day. Maybe, just maybe, he will let me hold his hand and sing him to sleep just a little bit longer.